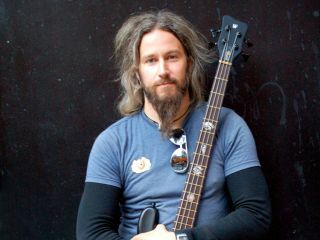 PRESS RELEASE: Warwick is honoured and pleased to announce joining forces with one of the powerhouses of modern metal, Troy Sanders of Mastodon. Mastodon is an American metal band from Atlanta, Georgia, formed in 1999. The band is composed of Troy, guitarist/vocalist Brent Hinds, guitarist Bill Kelliher and drummer Brann Dailor. They have released five full-length albums to date, expanding their musical borders from early raw sludge riffs to later psychedelic multi-layered songs, yet maintaining progressive style with unusual time signatures and odd instrumentation. Mastodon has risen through the ranks of the metal underground to playing sold-out arena tours with the likes of Metallica, Alice in Chains, Deftones and Dillinger Escape Plan. They are widely considered to be at the forefront of the recent upswing in heavy metal's popularity around the globe. Their latest record, entitled The Hunter, was released on Roadrunner/Reprise on Sept 26th, 2011. Warwick has inaugurated the occasion by building a custom Mastodon-themed Streamer Stage II, adorned with symbols from their past albums in beautiful silver inlay and bestowing it on Troy. Information taken from official press release, for more visit Warwick.